A supplement to our book dedicated to the understanding of the health of our thirty-second president. The story of how the existence of this T-shirt came to light defies all odds. On February 2, 1944, FDR went to Bethesda Naval Hospital for an operation to remove a "wen",known to doctors as an epidermoid cyst, from the back of his head at the hairline. It was described by Daisy Suckley to be about the size of a bantam's egg. 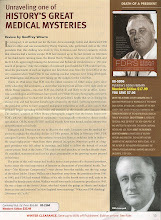 While the procedure was well known to have occurred, remarkable for anything pertaining to FDR's health, the details were not. Until the recent publication of Harry Goldsmith's book, rumors were rampant whether this was indeed a benign cyst of something more sinister and malignant. The operation was one of the subjects addressed in the press conference of February 4th, where the President deflected the problem in his characteristic style of it to reporters with some humorous, inane comments. The surgeon had been thought to be Winchell Craig, the chief of Neurosurgery at Bethesda. In fact, he was indeed present and scrubbed in but as first assistant to George Webster, the chief of plastic surgery. This fact was revealed in a letter from Webster to Goldsmith that Harry put in his book. Webster's letter also confirms that the surgical lesion was indeed a wen. He also described that the surgery was inordinately bloody and FDR's t-shirt became soaked with blood and had to be removed and replaced. After the procedure it was found, to the dismay of all present, that the bloody t-shirt had mysteriously disappeared. The entire hospital was locked down and searched but the shirt was never located. Webster bemoaned to Goldsmith that the fate of the t-shirt would never be known. This is where an astounding degree of serendipity enters the picture. About six years ago I was in Dayton, Ohio at the annual convention of collectors of Pulp magazines known as pulpcon (it has since been moved to Columbus). As most of my conversations at the time, I was speaking to one of the principal dealers, John Gunnison and the subject of my book on Roosevelt came up, since John was indeed a resident of Bethesda Maryland. "my father was one of Roosevelt's medical assistants and worked at Bethesda." I then mentioned the operation and was flabbergasted when John told me "oh yes, the operation was very bloody and FDR's t-shirt had to be replaced." When I enquired as to how he knew this he exclaimed, "my father was the one who was assigned to get a clean shirt. He took the bloody one, put it in his locker and replaced it with one of hos own!!" This conversation occurred at a time prior to the publication of Webster's letter, so there was absolutely no way that John could have known the story from anyone else and this was the first I had heard of it. As it turns out, I had told my story to one of only a handful of people in the the world who knew the shirt's whereabouts! The odds of this happening are in the billions! 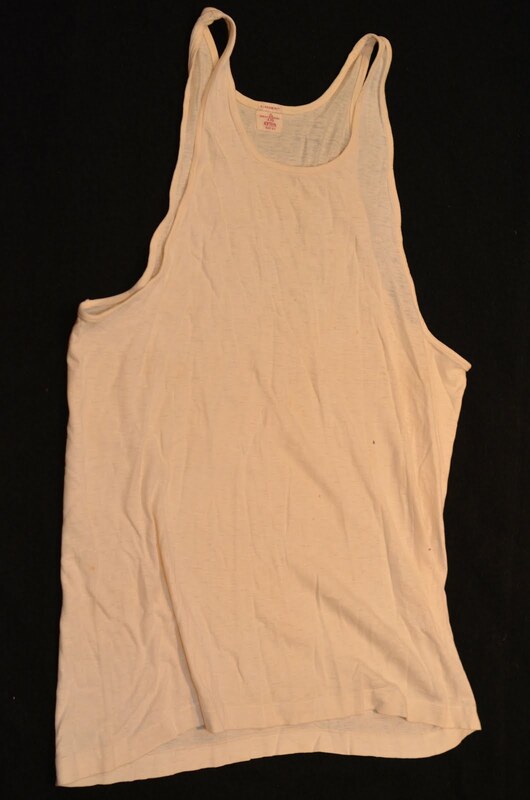 After purloining the shirt, he took it home where his wife thoroughly laundered it. It has been in the possession of the Gunnison family ever since and John has kindly supplied me with photos. 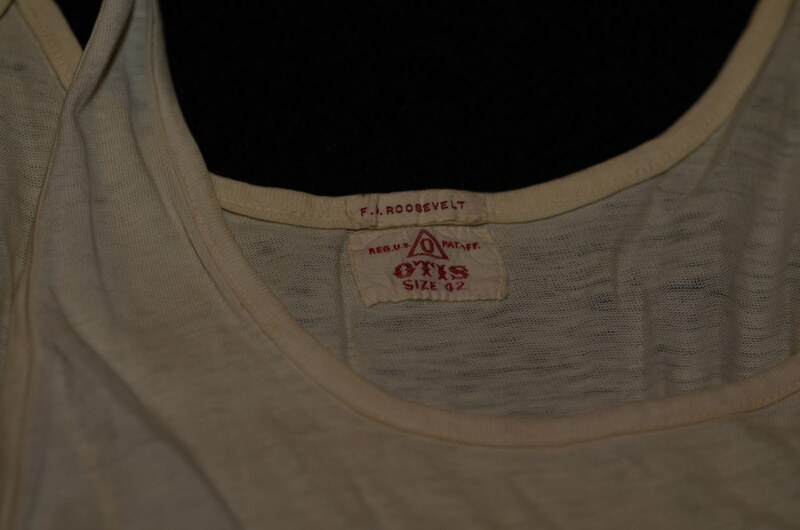 So here it is, FDR's long lost (formerly) bloody t-shirt.